The Dainty Shop are based online here and they sell the most beautiful home decor. From floral suitcases to owl cushions, if you're into cute, shabby chic home decor then you will love The Dainty Shop. I decided on a large painted Kilner jar. I've had my eye on a pink one for a while and finally decided that I'd order it to store my kitchen utensils in. 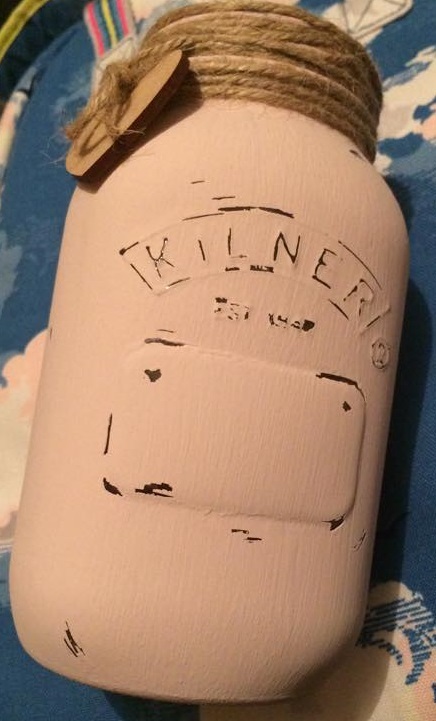 The Kilner jar is painted pastel pink with chalk paint. It's then distressed so it looks quite vintagey and unique, fitting with the shabby chic style! Twine is wrapped around the top of the jar and a little wooden heart is attached. This gives it a really cute touch. The jar is substantially sized, the perfect size for wooden spoons, spatulas etc and it's going to look precious on display in my kitchen. I definitely recommend checking out The Dainty Shop for all your home decor needs. Everything on there is so pretty, I could literally spend hours looking through their website!